I was in the neighborhood so I thought I would drop into one of my old favorite haunts. 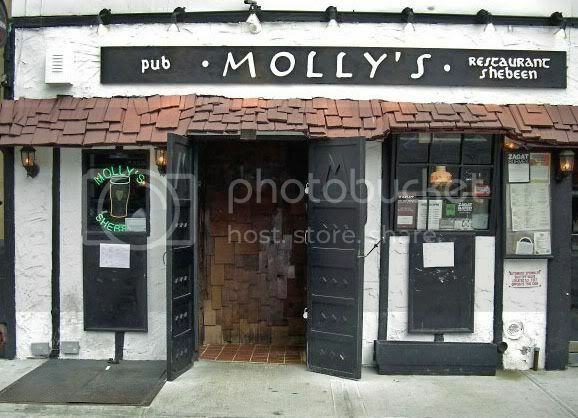 Now back in the day when this was pretty much my second home (I lived about half a block away) it was known as Molly Malone. Although the name and the ownership have changed, not much else has. It looks pretty much the same as it has always looked. 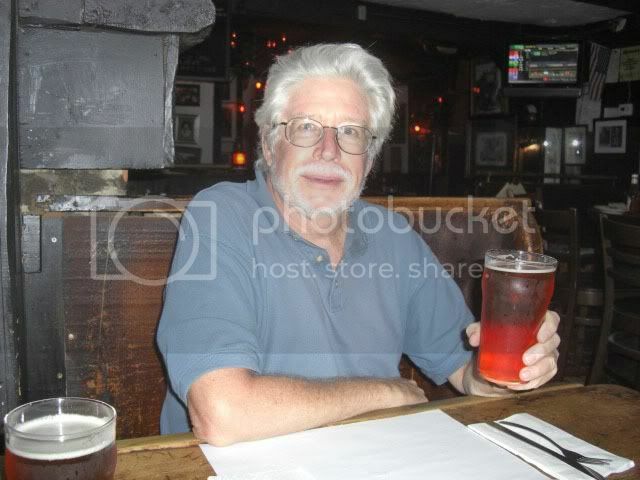 I had the ever reliable Bass Ale to quench my thirst. A lot of good memories in this place. I used to come in here with a friend of mine and we would drink our Bass Ales with shots of Old Grand Dad 114. One day we came in and they were out of the 114. We asked when they were going to get more in and were told they weren't going to carry it anymore because not that many people ordered it. When we protested that we ordered it a lot the bartender said that was the other reason they weren't going to carry it anymore. Ah, the good old days when we were young and wild. 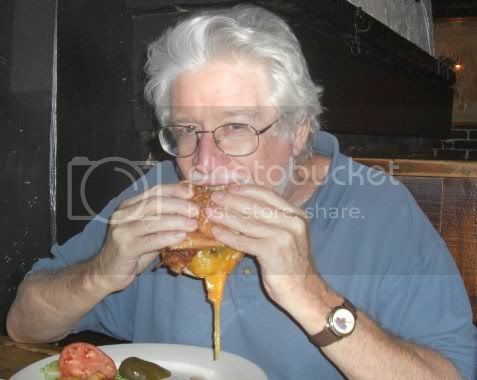 Another thing that hasn't changed, their hamburgers which are some of the best you can get. 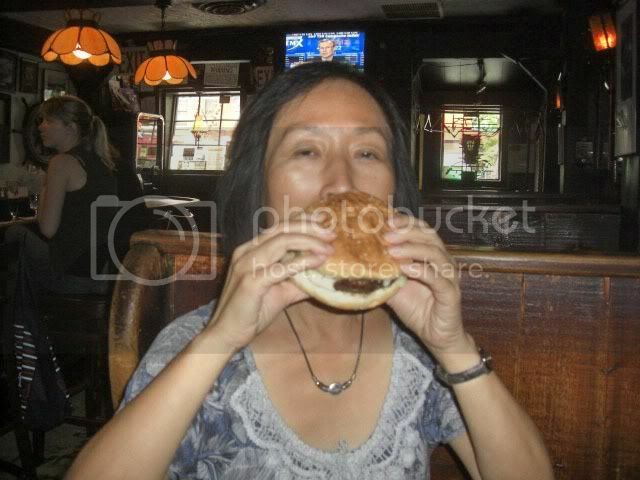 The Mysterious Chinese Woman ordered a cheeseburger with mozzarella cheese. Oh, yeah, the Mysterious Chinese Woman was lookin' good too as she dug in. 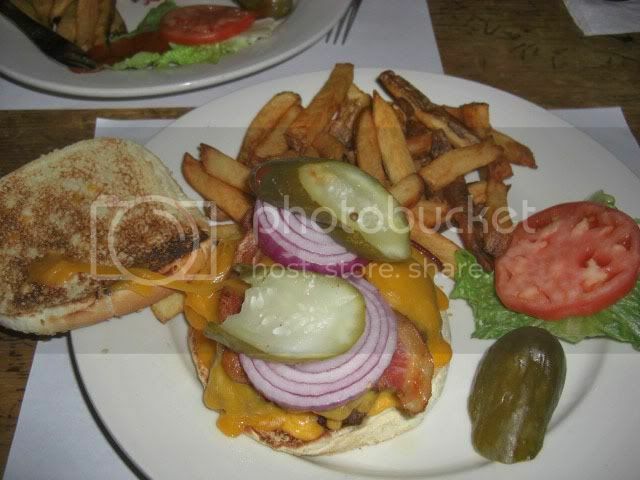 I opted for the bacon cheeseburger with chedder and then gussied it up with the raw onions and pickles. Mine was a bit messier, though. Ah, I have to admit, I miss this place, but Pete's Waterfront Ale House has become my new Molly Malone. 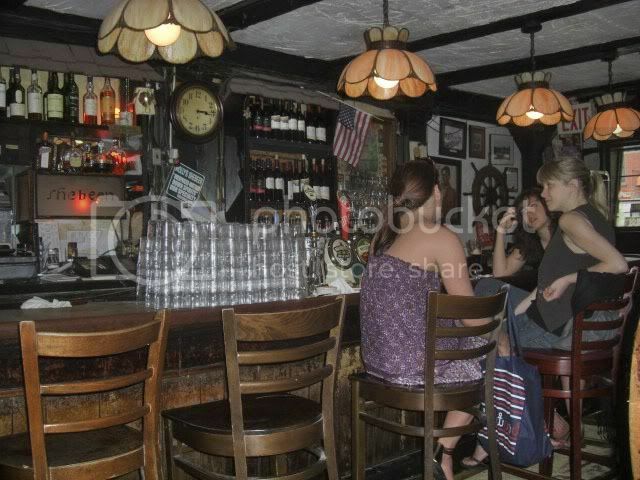 But I don't go there nearly as often as I once went to Molly Malone, which was about 5 or 6 times a week. In fact I had a set of keys to my apartment hanging behind their bar in case I lost mine. I should have tried one of their Irish Coffees, they were the absolute best that I have ever had in a bar and, for all I know, still are the best. 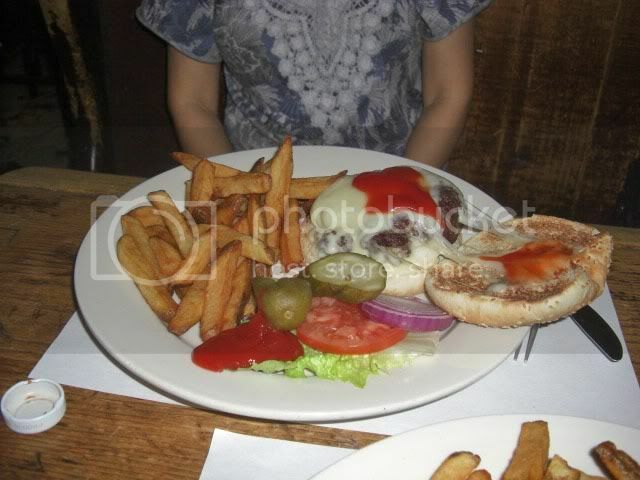 Although their hamburgers are dynamite, all of the traditional Irish pub grub here is a generous cut above the average. If I still lived in the neighborhood this would be where I would be hanging out. Heading out to my Mysterious Sister-In-Law's place today for a big Memorial Day weekend. Smoking ribs for sure and who knows what else. Maybe a couple of chickens and a leg of lamb too. We will also be celebrating Jim's birthday so that means a decent feast with lobster, for sure. We are going out today because Jim knows that I bought him Red Dead Redemption and he wants to spend a few days finishing up Zelda - Twilight Princess on the Wii before he starts it, and the Wii resides at the Mysterious Chinese Sister-In-Law's house. Oh, yeah, speaking of the Wii, the Mysterious Chinese Sister-In-Law is a huge Beatles fan so she has that Beatles Rock Band. Watching her and my three neices, ages 7 through 12 singing along to the songs is both amusing, and a bit disturbing. Have a wonderful Memorial Day and just think about this, Do you think the Rolling Stones would ever allow a video game to be made? Man, I really hope not. Now don't get me wrong, I have lived in New York for about thirty years now and love it. Although I travel quite a bit and there are other cities that I enjoy; Paris, Amsterdam, Madrid, Puerto Vallarta and many more, I prefer living where I do, Downtown Brooklyn. But, having grown up in the, according to New Yorkers, sleepy little town of Minneapolis which may or may not be west of Chicago (New Yorkers are very poor at geography) I still recoil a bit from New York's over-the-top braggadocio. Case in point, today's New York Daily News front page. Consider this, "Greatest city gets greatest sports event as NFL awards us Super Bowl 2014"
Now being proud of your city is fine, we all should be, unless you live someplace like Detroit. But is New York really the greatest city? Just wondering where that came from. A recent list of the cities with the best quality of life had New York at number 49, below Chicago, Boston, San Francisco, Portland, Honolulu (the top rated U.S.A. city) and a slew of European cities. And "greatest sports event"? American football is ranked ninth in popularity among sports throughout the world, well below Association Football (soccer to us) and Cricket. In fact, other than in the United States, ice hockey, baseball, and basketball are more popular than football. In fact, despite Mayor Bloomberg's statement "This isn't volleyball..., it's football for God's sakes," volleyball is actually more popular than football, worldwide. And the Super Bowl doesn't even come close to drawing the crowds of World Cup Soccer. Okay, how about the "NFL awards us Super Bowl 2014"? Us? Excuse me, the stadium is in the New Jersey Meadowlands, it is not in New York, either the city or the state. Kind of makes you wonder about Justin Tuck's (Justin plays for the Giants) statement "I want to win the Super Bowl in New York City." Oh well, I know this post will upset some of my New York friends, but really, the Super Bowl is not being played in New York. We tried to get a football stadium here several years ago, but it was voted down. We got two new baseball stadiums, though, and are about to get a new basketball arena (right down the street from me, in fact). On the other hand, I would bet that most of the partying happens in New York. Nick Swisher, he of the New York Yankees, was quoted in the New York Daily News as saying "Minnesota baseball, they've never really had an outdoor stadium to go and enjoy the great weather they have there in the summer." Guess Nick forgot the twenty years the Twins played at Metropolitan Stadium. Although, to give Nick the benefit of a doubt, that was 1961 to 1981, a bit before his time. Nick was born in 1980. Funny though, the New York Jets left New York in 1983 and the New York Giants left for New Jersey back in 1976, I guess, by Nick's logic, New York football has never had a stadium in New York. Still working on the designs for my New Jersey Jets and New Jersey Giants apparal. Somehow I need to incorporate seagulls into the design. If you have ever been to a game in the euphemistically named Meadowlands (Swamplands just didn't cut it) you would know why. But no, I am no longer bitter about the $15,000 per seat PSL the Jets wanted to charge me to continue to be a fan. Or at least a seat in the seat kind of fan. So now the New York papers are full of speculation and anticipation that the Super Bowl will come here in 2014. Here? Excuse me, but don't you mean that it might be coming to New Jersey? Mike Lupica actually said "If the Giants and Jets win this bid, the city wins. They would finally stop playing the biggest game there is out of town." First of all, the Super Bowl is far from being the biggest game there is. World Cup Football anyone? And, secondly, if the New Jersey Meadowlands isn't "out of town," then I don't know what out of town is. Last time I looked it was about seven miles from Times Square. Actually, Jersey Jets and Jersey Giants have a certain alliterative allure. And, if they changed the name of the teams you could then buy new New Jersey jerseys. I mean, when the Dodgers moved to Los Angeles from Brooklyn they didn't still keep calling themselves the Brooklyn Dodgers. I wonder if the Nets will still be known as the New Jersey Nets once they begin playing in Brooklyn. After all, it doesn't seem to matter where you play that determines the name of your team, at least not around here. You know, I bet you could make good money selling New Jersey Jets and New Jersey Giants apparel.